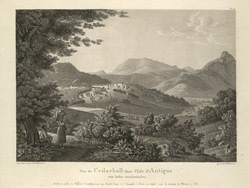 An engraving of the Cedar Hall plantation on Antigua, made from a drawing by Stobwasser, and completed in 1830. It shows the great house and a number of enslaved people, including a chain gang and overseer, at work in the fields. As with many such views, it presents an idyllic image of plantation life ? a view which would have been far removed from the harsh reality of the everyday lives of its enslaved population.